Choosing the best schools for culinary arts can be the key to having a successful career in the culinary field. International students should do a lot of research before making the decision as to which of the top schools for culinary arts is perfect for them. You should consider certain factors when researching these schools, for example, do you want to specialize in a certain regional cuisine, or are you interested in a specific cooking style? Are you trying to focus on pastry and baking, or would you rather study culinary management…your options are endless in the U.S.! Luckily for international students, there are top schools for culinary arts all over the United States; you won't have trouble finding a good school and you can choose to study in a place that is fun and interesting to live in! The Johnson and Wales University's College of Culinary Arts	was the first school in the country to offer a bachelor of science degree in the Culinary Arts in 1993. JWU's Culinary Arts College has an impressive reputation and is considered to be one of best schools for culinary arts in the world. 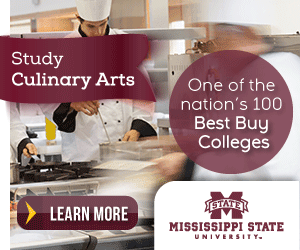 The school offers associates and bachelor degree programs in Baking and Pastry, Culinary Arts, Culinary Nutrition, Food Marketing and Services has been named the one of the best culinary schools in America by Emeril Lagasse. In 2010, 90 percent of JWU's students received some form of financial aid and students can earn their degree at any of the Providence, Rhode Island, Miami, Florida, Denver, Colorado, or Charlotte, North Carolina campuses. There are more than 1,700 international students currently studying at JWU from more than 93 countries. Also, International Student Services (ISS) helps international F-1 and J-1 students with issues related to housing, visa status, employment, and adjusting to life in America. Another one of the top schools for culinary arts is Le Cordon Bleu College of Culinary Arts in Pittsburgh, Pennsylvania. Le Cordon Bleu not only has a rich heritage but also famous alumni such as Julia Child. This school focuses on having students participate in a hands-on style education. Students learn from professional chefs who have real experience working in the culinary field. The school offers flexible schedules for its students and specialized programs in Culinary Arts, Pâtisserie and Baking, Culinary Management and Hospitality & Restaurant Management. Le Cordon Bleu also offers a full 15-month "Associate Degree in Specialized Technology in Le Cordon Bleu Culinary Program," and an "Associate Degree in Specialized Technology in Le Cordon Bleu Pastry Program". International students whose native language is not English will need to prove their proficiency in English by completing a TOEFL or other English proficiency assessment. There are other Le Cordon Bleu campuses all over the States as well; Orlando, Florida, Austin, Texas, Las Vegas, Nevada, and San Francisco, California – just to name a few. The Institute of Culinary Education in New York City is one of the best schools for culinary arts in the country. In 2002 and 2003 ICE was a finalist and winner in the International Association of Culinary Professionals' Vocational and Avocational Culinary School of the Year awards. Also in 2008, the school won the International Association of Culinary Professionals (IACP) Award of Excellence for Best Vocational Cooking School. Many of ICE's students and alumni are nominated for or win top industry awards such as Food & Wine's Best New Chefs in America, Pasty Art & Design's Ten Best Pastry Chefs, and James Beard Awards. The school offers comprehensive career training diploma programs in Culinary Arts, Pastry & Baking Arts, Culinary Management and Hospitality Management in 6 to 13 months. ICE has international students from more than 44 countries around the world and assists these international students with housing, out-of-state allowances, tuition discounts, and affordable health insurance. It's a top choice for many in the world of culinary arts schools. In conclusion, international students have some very impressive options when it comes to choosing between the top schools for culinary arts. You should consider what type of learning experience you want to have; for example a hands-on learning environment, a small intimate classroom setting, or the typical American university learning experience. Make sure to research the culinary style of the school you are interested in to make sure they offer classes in the cuisine you want to learn about. You can earn your diploma in as little as 6 months, or you can earn a four-year degree from a university. It's up to you to decide!